Farsi, Dari and Tajiki each have different words for “Turkey” (the food you eat at Thanksgiving, not the country I’ll be visiting in three weeks). 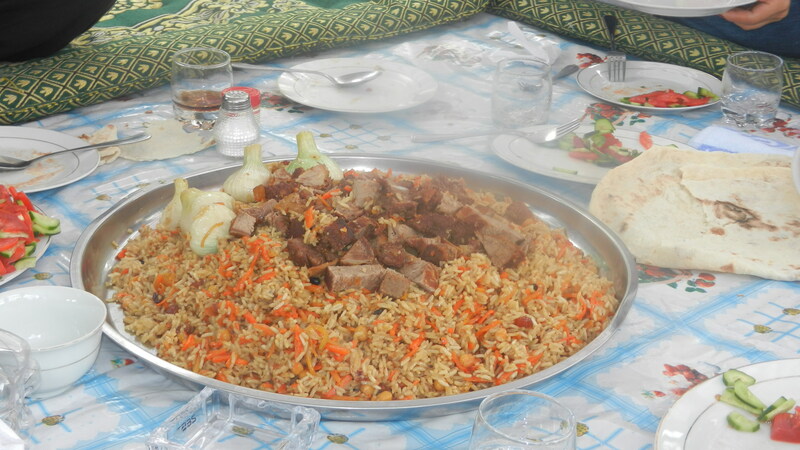 In Farsi, its بوقلمون / Buqalamun. Oddly, Buqalamun means chameleon in Tajiki. In Tajiki the word for Turkey is мурғи марҷон/ Murgh-e Marjon, which literally might mean “Coral Chicken,” if I understood my professor correctly. My favorite, however, is the Dari word, فیل مرغ / Feil Murgh, which literally translates to “Elephant Chicken.” It reminds me of Dr. Seuss. 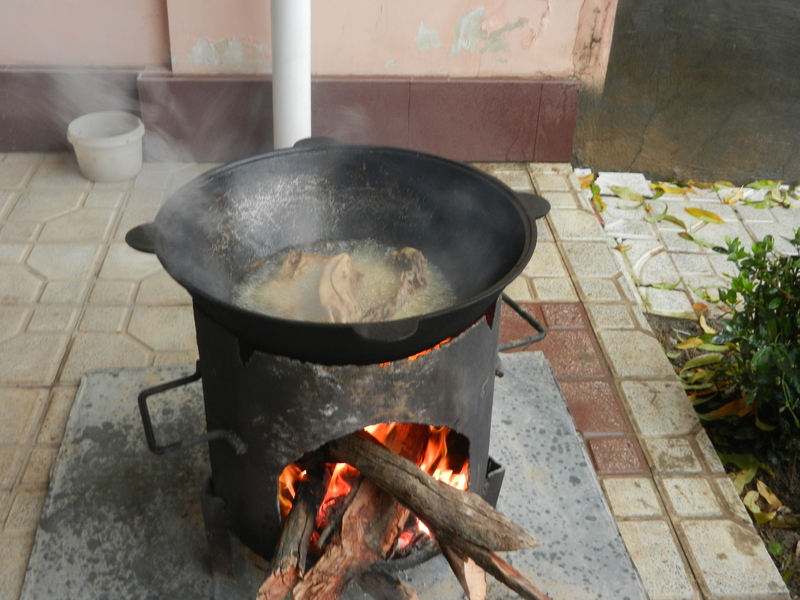 This is how you make Thanksgiving dinner, Tajik style. 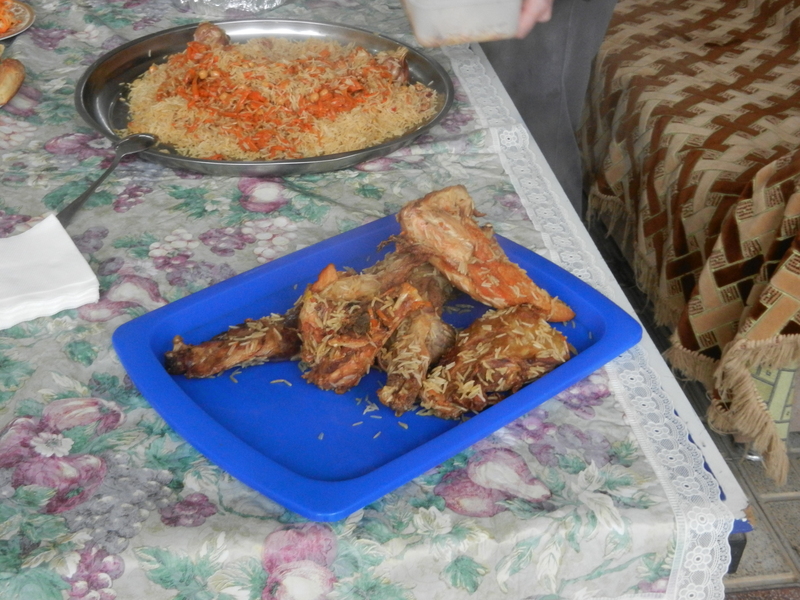 I was lucky enough to get some delicious Elephant Chicken this Thanksgiving, despite being in Tajikistan. We had the day off for Thanksgiving. While our professors and administrators prepared Osh and Turkey in the very-advanced-technology you see above, we sat inside and drank coffee and watched Charlie Wilson’s War (three lines in Dari for the win! ), and eventually emerged to make some hot apple cider and enjoy the feast. Obviously, it wasn’t the most traditional of Thanksgivings- there was Osh, after all, but the Osh had cranberries in it, and there was Apple Pie for dessert, and it was spent in good company. 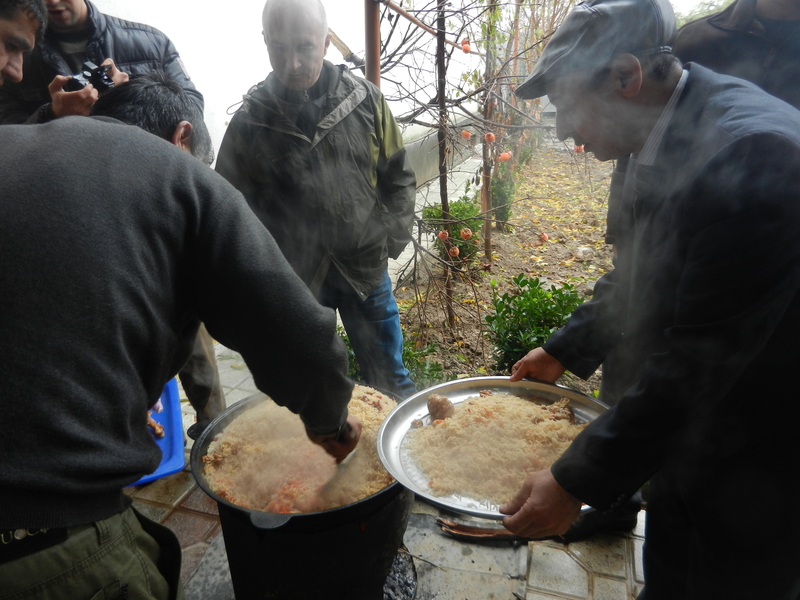 We stood around the courtyard and discussed the various terms for Turkey, and used the hot apple cider to protect agains the cold Dushanbe weather. 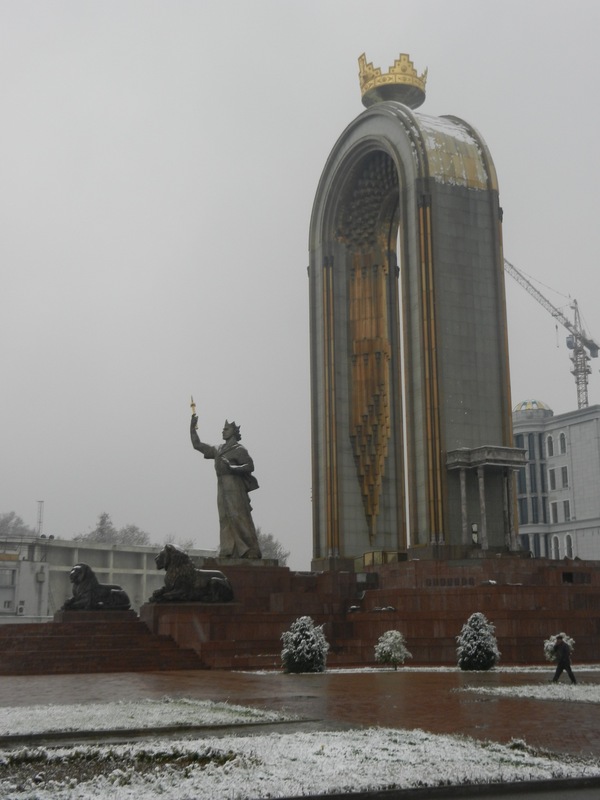 Also, I should mention that Tajikistan’s National Flag Day happened to coincide with U.S. Thanksgiving. What an incredible coincidence! Except that no one in Tajikistan seemed particularly excited about Flag Day. I mentioned it to my host family, and asked if they’d gone to the parade, and they laughed at me and said they didn’t even know Flag Day existed. Our Thanksgiving Turkey! On a lunch tray... on a ping pong table. Pretty freaking classy. Despite the fact that Thanksgiving was delectable, it was not, in fact, the most exciting food related event of my week. That took place on Saturday, and began, as all good things should, with a long walk. I was visiting a friend who lived on a backroad, and decided to take a meandering path to get back to the main street. 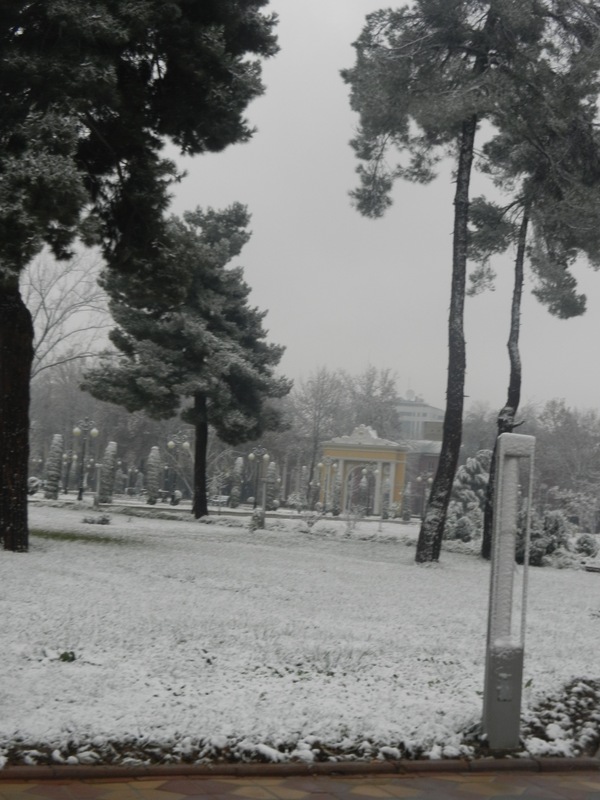 It was snowing and beautiful out: I’ve come to believe that Dushanbe is miserable in the rain, but absolutely delightful in the snow. Anyways, I wandered along, found a quaint little park and some interesting looking neighborhoods, and just as I was starting to feel cold and hungry, the side road I was on opened up onto Rudaki Ave, and I found myself next to a small Iranian Kabob Shop I’ve been meaning to try for ages. It was perfect. It was filled with elderly Iranian men joking in Farsi, the Iranian version of MTV was on, and since the menu was in Farsi script, it didn’t take me several hours to read! I had kubideh kabob and a big pot of tea, for less than 3$. I plan on frequenting this place very often. 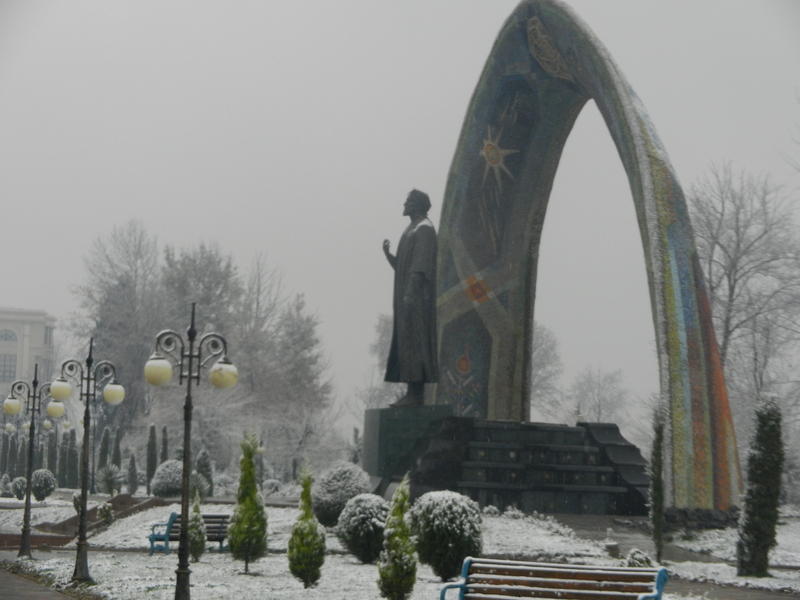 Ismail Somoni, AKA the Wizard of Dushanbe, and his snow lions. In other news, its getting pretty close to winter break- in just about three weeks I’ll be boarding a plane to Istanbul. 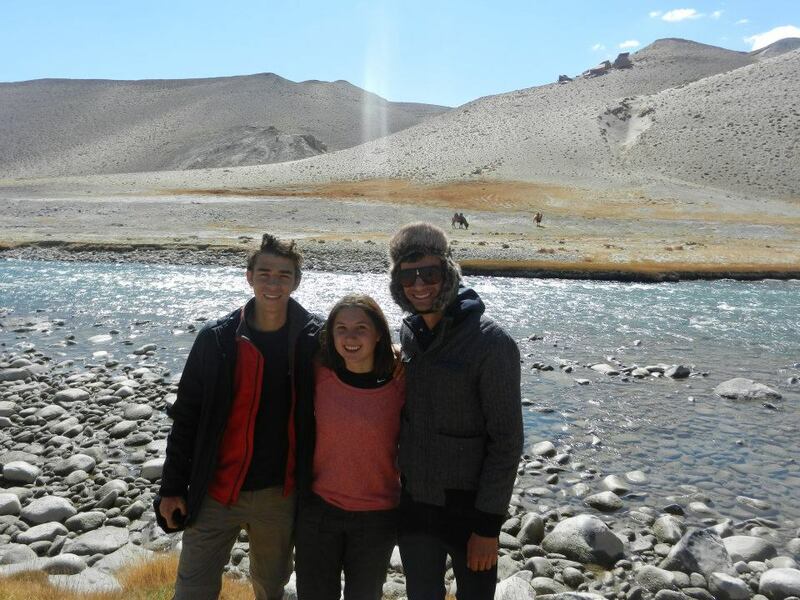 I am very glad that I am coming back to Dushanbe for a second semester after break. I am equally as glad to have a few weeks off, and incredibly excited for the steady supply of strong electricity and even stronger coffee in Europe.